We hope you have a wonderful and special day! You are our little princess and deserve the BEST! Maggie's 5th Birthday was on April 23, 2002! Here're are the birthday wishes sent for Maggie by her cyber friends!! "We hope you have the best Birthday ever!! 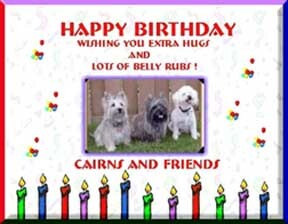 From Lucky, Lady Rose and Opal"
"Hope you get lots of belly rubs and treats for your birthday! Extra special wishes come your way because you share your special day with me, Gracie!! we hope you have a fantastic day, swimming, eating and opening presents! Your swiss Cocker pals, Luna, Stella and Yvonne"
"Happy 5th birthday Maggie! I thought I'd send along a funny birthday picture of myself, to give you a giggle! 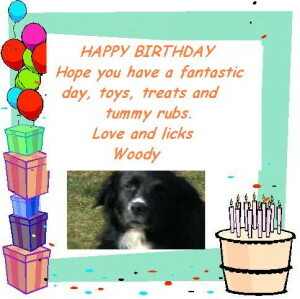 Love and best wishes, Murphy"
All of us from Cairns and Friends wish you lots of love and great belly rubs.